RAIL Back On Track (http://backontrack.org), a web-based community support group for rail and public transport and an advocate for public transport passengers, has called on the State Government to explain why seven temporary Sunshine Coast Line rail platforms located at Mooloolah, Eudlo, Palmwoods, Woombye, Eumundi, Pomona and Cooran, are still there. The platforms were erected December 2009 to January 2010. A QR Passenger document said that they were a short term solution and ‘will ultimately be replaced with a permanent platform within a period of 12 to 18 months’(1). They are all still 'temporary' almost 8 years later. "The Sunshine Coast has to be the most rail neglected region in Australia. Our deficiencies start with an antiquated tortuous single train track, 29% of daily trains that are literally buses, a service frequency of 1.5 – 2 hours throughout the day and, if all that isn’t enough to deter you from train travel, a series of ramshackle temporary railway platforms that are still in place almost 8 years after they were constructed." "In February 2012, some 2 years after their ‘temporary’ construction, they were costing us almost $300,000 per annum. Today, we estimate that over $2.5 million has been wasted. In that same month it was also discovered that the timber plywood platforms were being eaten away by fungi (2). 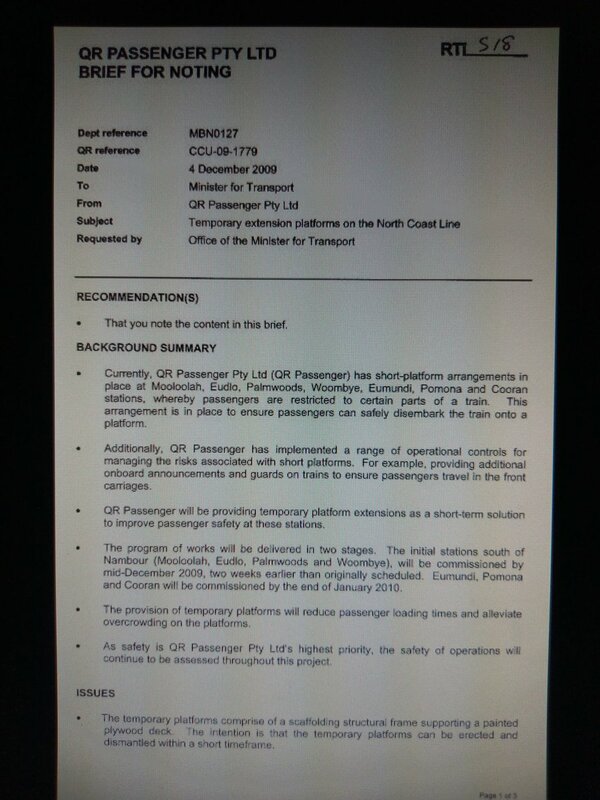 "The litany of promise breaches has continued with the most recent promise to replace 3 of the seven platforms located at Eumundi, Pomona and Cooran, north of Nambour, with permanent ones, by December 2016, broken once more. Today, in October 2017, no work has even started. Jeff Addison went on to say..
"We are tired of the rail neglect. We are tired of the wasted money. We are tired of our wasted time. We are tired of the sub-standard single line, we are tired of the breaches of promises that fill our rail history on the Sunshine Coast. "We want to see rail prosper. We want to see happy commuters. We want to see patronage and freight increase, we want to see traffic congestion ease, and we want to see trucks off the highway that needn’t be there. We want to see passengers on safe stable station platforms – not ones that get eaten away by fungi.
" 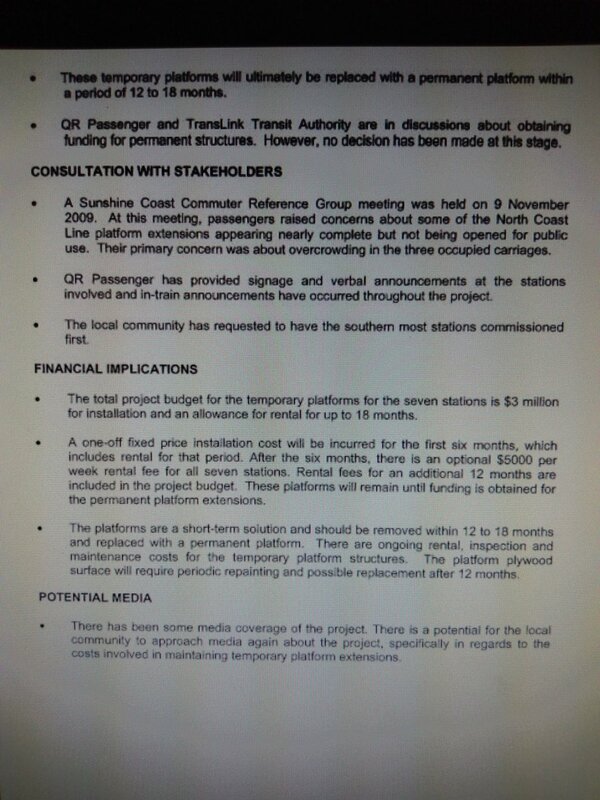 'Promise Much' and 'Do Nothing' is the State Government action plan for the Sunshine Coast, from our single train track to our permanently 'temporary' platforms. "Who knew that Premier Annastacia Palaszczuk’s plan for jobs in our region, her claimed number one priority, was full time roles maintaining temporary rail platforms that are regularly eaten away by fungi? 2. 10th February 2012: Mushrooms growing from Sunshine Coast temporary rail platforms could be safety risk, with a "strong possibility that it will give way"